Lifestream Bioactive Spirulina contains a concentration of nutrients including antioxidants, chlorophyll, minerals and unique phytonutrients. Spirulina also contains phycocyanin which is a unique spirulina pigment with antioxidant properties. All eight essential amino acids - and ten non-essential amino acids – in terms of nutritional profile, spirulina is the closest thing to mother`s milk. High Iron, Calcium and mineral content - Iron & Calcium for healthy blood, bones, nerves and muscles. Spirulina is nature`s richest wholefood source of Biochelated Iron, which is completely non-toxic. 58 times richer than raw spinach and 28 times richer than raw beef liver. Low fat content - proper balanced nutrition reduces the body`s craving for food. Coupled with virtually no fat, spirulina may be a great addition to any weight loss programme. 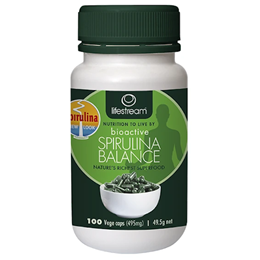 Premium Spirulina Powder (81%), vegetarian capsules (hypromellose). Starting Up (first week): Take 2 - 4 capsules daily. Sustained Nutrition: Take 7 capsules daily. Optimum Nutrition/Special Uses: Take up to 21 capsules daily. 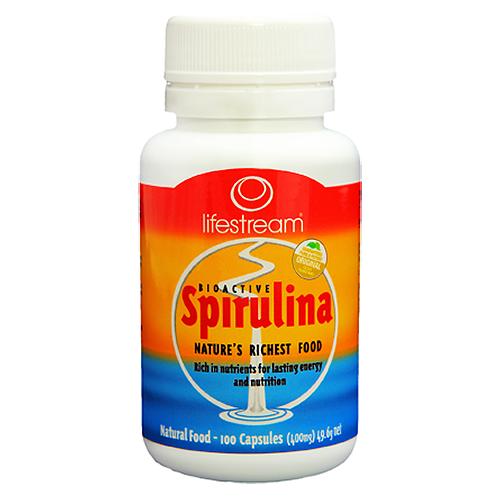 Below are reviews of Lifestream Bioactive Spirulina - 100 x 400mg Capsules by bodykind customers. If you have tried this product we'd love to hear what you think so please leave a review. Made a real positive difference. Recommended. This is a fantastic product, really easy to take, as I much prefer the capsules. I would definitely recommend. Very quick delivery. Bodykind is an excellent company to deal with.